Testimonials: Cancer is no longer a fearful disease and it can be defeated by positive attitude and reliable doctors. On May of 2016, SUNG DJAN TJU, Indonesian, a patient with advanced nasopharyngeal cancer, came to Modern Cancer Hospital Guangzhou for review once again. Gratefully, the test result is the same as before: CT examination shows no tumor recurrence and metastasis, tumor has completely disappeared, which indicates that she has made a miraculous survival of cancer for seven years. According to her doctor Lin Jing, for health considering, in addition to the review, the patient needs ozone therapy to consolidate the current condition. In 2009, SUNG DJAN TJU, 60 years old, found herself an egg-sized lump in the throat. 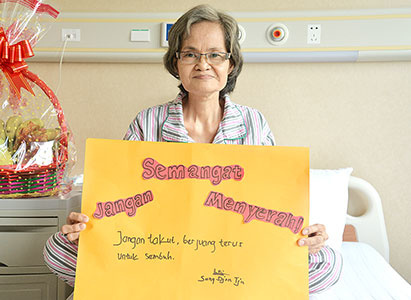 After medical checkups in Indonesia, she was diagnosed as nasopharyngeal cancer patient and local doctors performed surgery for her. But two months later, tumor relapsed and doctors recommended surgical treatment again. SUNG DJAN TJU’s sister in law told her: “No more surgery again. Let’s go to Guangzhou for further treatments, as many of my cancer friends do. I know a doctor named Lin Jing who works in MCHG.” Finally, SUNG DJAN TJU took her advice and came to MCHG in July, 2009. After a full examination, SUNG DJAN TJU was diagnosed with advanced nasopharyngeal cancer with recurrence and metastasis. Realizing the serious condition, she was so fearful, depressed and hopeless. However, with earnestly enlightenment, persuasion and consolation from her daughter, as well as MCHG medical workers, she changed attitudes towards cancer. She said: “I will give myself to God. As for the treatment effect, let nature take its course.” As a Catholic, SUNG DJAN TJU made daily prayers, reminding herself to be strong. Finally, she regained her previous optimistic attitude and cooperated with doctors actively. According to her individual condition, MDT made a final treatment plan. After two courses of consecutive interventional treatment, as well as concurrent chemo and radiotherapy, SUNG DJAN TJU’s condition improved markedly, and the tumor finally disappeared. When talking about SUNG DJAN TJU, who has survived from cancer by comprehensive minimally invasive treatments, the attending doctor Lin Jing also has mixed feelings. She says it is a miracle, but this kind of miracles usually happens in Modern Cancer Hospital Guangzhou. Mostly, people hold the view that once has cancer; he/she is destined to die. But with the current medical level, cancer can no longer be defined as an incurable disease, but a chronic one. According to Lin Jing, the seven years of survival range owe to two points. Firstly, timely and standard treatment is necessary. Secondly, psychological counseling by family members and medical works from MCHG, which helped her with a relaxed, calm, brave, and confident attitude towards the treatments. For now, SUNG DJAN TJU has a more profound awareness of the precious life. For leisure time, she likes to travel around accompanied by her family members. So far, she has been to Malaysia, Bali, Kalimantan and many other places. To be a travel enthusiast, she wants to visit many other places after the review. “Travelling makes me optimistic and pleasurable, help me enjoying life like a normal person, I like this feeling," she says.